A topping-out ceremony has been held to celebrate a huge milestone in the construction of the brand new University Centre Rotherham (UCR) in the town centre. In the autumn of this year, the RNN Group will open the centre on Doncaster Gate to offer state-of-the-art facilities and a wide variety of degree courses accredited by top universities and awarding bodies, including Sheffield Hallam University and the University of Hull, with plans for over 50 courses to be running at UCR by 2020. Willmott Dixon are just months away from completing the build. "Topping-out" is the term used by contractors to refer to the installation of the final piece of structure, or the completion of the roof on a building. Representatives from organisations backing the important regeneration project gathered to mark the occasion. These include Rotherham Council, the Sheffield City Region (SCR), Rotherham Together Partnership and Lloyds Bank. John Connolly, chief executive for the RNN Group, said: "It's fantastic to see our new University Centre Rotherham really starting to take shape and beginning to take its place on the Rotherham skyline. "Over the coming months, people will hear much more about the courses and brilliant facilities, and we'll be working closely with more employers to get them involved so training meets their needs for highly-skilled staff." The UCR's model is based on offering an alternative technical education with Level 3 courses and apprenticeships up to degrees and degree apprenticeships at Level 4 to 7. Andrew Denniff, chief executive of Barnsley and Rotherham Chamber of Commerce, said: "The culmination of this project will bring what many businesses in Rotherham have been hoping for a long time - a university campus in our own town and in a central location. The number one priority for a majority of businesses is getting staff with the right skillset and developing our own "home grown talent" will prove a major step forward. This also ties in with the Rotherham Together Partnership "game changer" of increasing skills and employment in the borough." Cllr. Denise Lelliott, Cabinet Member for Jobs and the Local Economy at Rotherham Council, added: "University Centre Rotherham will be a great asset to the borough. As Rotherham looks forward to a future with more growing and innovative businesses, the UCR will help to develop a home-grown future workforce with the necessary skills and knowledge." Rotherham Council has provided the land for the campus in a cut price deal. The SCR Combined Authority agreed to fund infrastructure works with a grant of £3.5m approved with the balance coming from RNN Group. 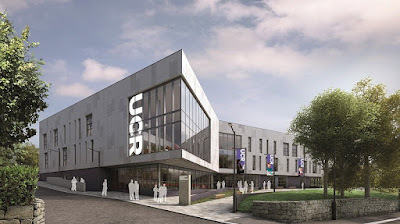 Nigel Brewster, vice chair of the SCR Local Enterprise Partnership, said: "The University Centre will help to attract, retain and develop skills in the region which are so important for the SCR’s sustainable growth. It will be a major asset to Rotherham and the employers and workforce of the region - the "let's get it done" work-ethic in Sheffield City Region harnesses drive and ambition." The 35,500 sq ft campus building has been designed by Bond Bryan to accommodate approximately 560 people on a typical term day but will be built with expansion in mind and teaching space for approximately 1,000 students. Options for expansion on the site of the former Victorian hospital are already being looked at. Richard Stowell, operations manager for Willmott Dixon, said: "UCR has made fantastic progress since the start in September 2017; in the space of a few months we have completed the groundwork, erected the steel, cast the floors and started the perimeter cladding. 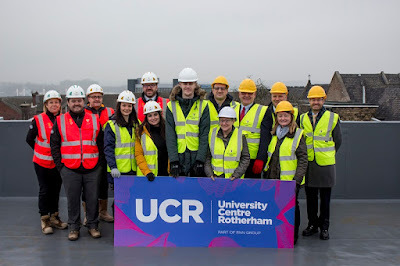 "The roof topping out marks a significant milestone in the project calendar as we begin to commence internal trades, and is another milestone in our work to achieve completion later this year, so that UCR can welcome its first students this autumn."